Size: 34 x 47 cm. Title: 'Tabula X Asiae'. Published in Strassburg by Johannes Gruninger. Striking and beautifully detailed woodcut engraved chart of region bounded by Afganistan and Pakistan to the west and by China to the east, showing most of India and extending north to the Himalayas and south to the Indian Ocean. Detailed to show cities, villages, mountains, rivers, lakes, etc. Decorative title cartouche to the top. 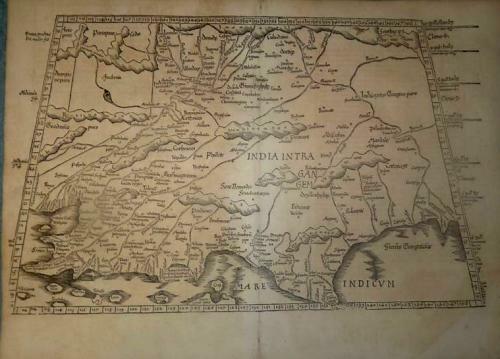 Map from: "Claudius Ptolemaeus Geographicae..." by Gruninger, for J. Koberger, Strasbourg, 1525. Verso: Latin text surrounded by woodcut decorations. Very strong and dark impression on very strong paper. Uncolored as issued. Wide margin to the top. Wide lower margin. Wide right lateral margin. Good left lateral margins. Small browning and foxing. Small holes inside in the chart. Cartographer: Claudius Ptolemy ( 87 - 150 A.D. ) was a greek geographer and astronomer of Alexandria. Codified cartographic ideas and data in his Geographia, which gave instructions for map-making, including a system of coordinates. Ptolemy's text has survived, but no maps known to have been drawn by him. The oldest known Ptolemaic maps date from about the 13th century; they were made following the information in the Geographia. Ptolemy's work was lost to the West for centuries, but survived in the Byzantine Empire and Islamic societies, and was rediscovered during the Renaissance. Many editions of the Geographia have been published, the first printed edition with maps being Bologna, 1477.